Jose Antonio Cordeiro Otero received the Falkland Islands’ Queen’s Certificate and Badge of Honour in recognition of his services to the Islands. Spanish citizen Jose Antonio Cordeiro Otero has received the Falkland Islands’ Queen’s Certificate and Badge of Honour in recognition of his services to the Falkland Islands and particularly for his work in the fishing industry. 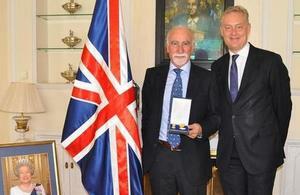 The award was presented by the British Ambassador Simon Manley today during a ceremony at the Ambassador’s Residence in Madrid. Antonio arrived in the Falkland Islands in 1988 and lived there until he returned to his native Galicia earlier this year. He worked for the Falklands fishery from its creation and also supported the establishment of The Mission to Seafarers in the Islands’ capital Stanley, which provides support and welfare during times of crisis or need to the men and women who work on the high seas. However, his most important achievement was in developing and fostering relationships between the Spanish and the Falkland Islands’ fishing industries. Previously the relationship between the two fishing industries consisted of little more than simple licence arrangements. Today joint ventures between the two fisheries are not only commonplace but essential to the Islands’ economy. It is safe to say this would not be the case had it not been for Antonio’s tireless work in this area. As a result he enjoys widespread respect amongst his peers – not an easy thing to achieve in such a tough and demanding industry. I have had the privilege of serving two countries I feel I belong to. The ceremony was attended by Antonio’s family and friends as well as by the British Embassy’s Defence Attaché Paul Lemkes.